Japan Beauty Week in Kuala Lumpur. 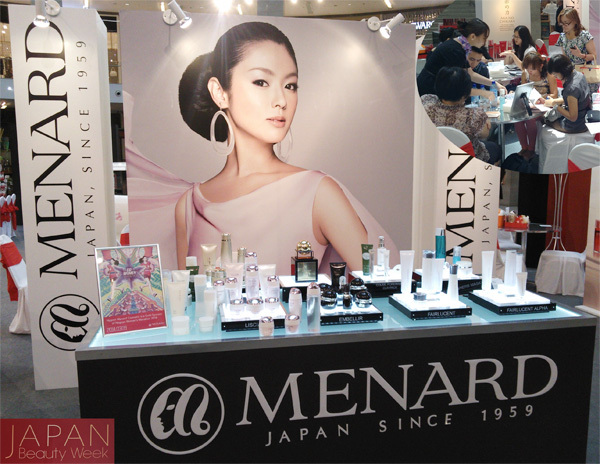 From February 27 to March 2, 2014, Menard participated 'Japan Beauty Week in Kuala Lumpur' that was held in Malaysia as a part of 'Cool Japan' policy. Menard, along with five other cosmetics companies including Shiseido and Kose, presented a booth showcasing Japanese cosmetics at 'Pavilion', one of the famous shopping malls in Malaysia. The event was sponsored by Japan's Ministry of Economy, Trade and Industry as a way of promoting Japanese cosmetics to overseas markets, and received large numbers of visitors over the week. At the event, Menard introduced skin checks in Malaysia for the first time. Skin checks involve customers having their skin keratin sampled, sent to the skin check center in Japan for analysis, and based on the results, the customers can receive appropriate counseling and beauty advice. With the cooperation of the Malaysia store managers, the skin checks proved to be extremely popular, with a large number of visitors able to try skin checks and experience the counseling and advice supported by Japanese technology.